As of the date above, I have identified 57 different T206 poses that have been signed by their subjects. Nearly all of these have been certified authentic by PSA, JSA, SGC, or BGS. The few that haven't either come from the Jeff Morey collection or were certified by another respected expert in the field. They are listed below. I own 41 different examples, which you can see by clicking here. Examples of 16 signed poses I don't own (which are bolded in the list below) can be seen by clicking here. It’s been over 10 years since The Great Pittsburgh Find of Signed T206 cards. This is a good time to reflect on the discovery of those amazing cards, what signed T206 cards have surfaced since then, and what the known autographed T206 cards in the hobby can tell us about overall populations of signed T206 cards today. 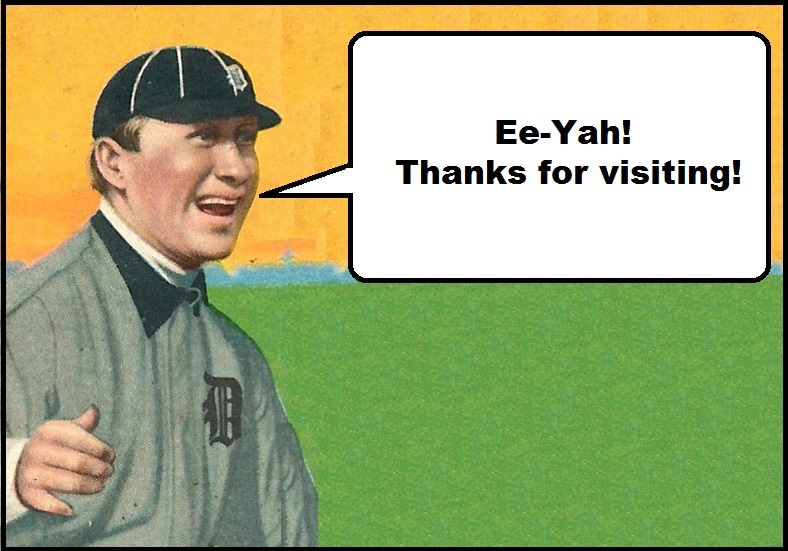 By way of background, at least 54 autographed T206 cards from one massive collection of signed pre-war cards and items began to make their way into the market during the summer of 2007. It is believed that the original owner/collector was a sportswriter. The sportswriter, whose first name appears to have been Rudy (thanks to a responsive letter to “Rudy” from Fred Snodgrass), compiled this collection likely through the mail. He also had numerous letters written by the players. His heir (maybe nephew) began to make the rounds of Pittsburgh dealers, including "ctang50" and "r.c.means" on ebay. He also hit the Pittsburgh show that year, and met with several autograph dealers, including Phil Marks. Back then, many of the cards could be had for $200 to $400, depending on player and condition. Today, those same cards sell for over $1,000 – sometimes much more. By the way, the Cobb is stunning. Amazingly, Morey was able to get the Georgia Peach’s signature in person while Cobb was eating breakfast in Cooperstown on June 27, 1960. In November 2013, Heritage held the largest signed T206 card collection auction in six years. Not only did this auction feature the first offer of a signed T206 Rucker (throwing pose) since Morey’s sale in 2001, but the prices realized were more or less astronomical, when compared with the most recent public sales of many of these cards. Ironically, though Marquard is the most popular signed T206 subject, not a single Marquard was available. However, the other "usual suspects" Doyle and Snodgrass were featured, as well as an ultra-rare Tommy Leach portrait. For collectors looking to add HOFers, you had three to pick from -- Flick and Crawford, who both went for over $6,500 -- and the cleanest signature on a Wheat imaginable, which explains the nearly $4,000 price tag. No new discoveries here, but still wonderful cards nonetheless. During 2015-16, a signed T206 Tris Speaker (shown below) fetched $32,310 at auction -- the highest price ever recorded for an autographed T206 card at auction by thousands, exceeding the $27,600 a signed Cobb Red Background sold for in 2010. Speaker held the mark for a few months, until Heritage auctioned an amazing signed T206 Cobb Bat Off for a current record price of $33,460 in August 2016 (shown below Speaker). It should be noted that a signed Cobb Bat On sold for $25,080 at auction earlier that spring in BST Auctions. Other than described here, there have been very few other sightings of authentic autographed T206 cards. I am aware of a number of additional signed poses that exist in private collections, including Bresnahan Batting, Chance Yellow, and Phillippe, but they are sprinkled around ad hoc – again, not necessarily attached to any single larger collection of signed T206 cards. Poses not mentioned here that also exist include Johnson Pitching, Young Portrait, Rucker Portrait, and "Doc" White Portrait -- each part of my collection of 41 different signed T206 cards, which you can see by clicking here. Add those to the 16 I’ve seen but don’t own -- which you too can see by clicking here -- and we’re talking about 57 confirmed (and authentic) different signed T206 poses. My lifetime goal is 50, which doesn’t seem like a lot, but I would be unbelievably lucky to achieve that threshold! If you are aware of any additional poses of signed T206 cards, or any hidden collections of T206 cards in the hobby-sphere, please be sure to let me know. Who knows what the next 10 years of collecting will bring? Only one thing is certain – since ole Rule Marquard died nearly 40 years ago, they sure aren’t making any more!